Regarding the compensation criteria, it is necessary to notify the withdrawal request. And before gaining rights to 17 channels that did not pay the fourth war license, the remaining half of the total amount of 3,215.2 million baht will be paid within 120 days or within August 8, 2019 with the NBTC office. If it is unable to pay, it pays interest at a rate of 7.5% a year, refusing to return to 3 channels, i.e. Channel 7, Vorkpoint Channel and Spring Nevs Channel, which paid 5 times in the previous amount of a total of 986.6 million baht. Select Operator Effective Application Up Before Vacation 2228.6 Million Bat Back In Digital TV License Periods 5 and 6 Total 13622.4 Million Bat will be excluded in full. For Network Charges (MUKS) The remaining 9-year and 6-month NBTC licenses will be paid out in the total amount of 18,775.8 million Baht, which will be offset by an auction at a frequency of 700 MHz, as well as ratings. NBTC will allow the Digital Television Association to be a central organization that will provide a budget rating of 431 million baht. "On April 19, NBTC will nominate a relevant workgroup, with work hours to be completed by June or within two months, and 4-5 channels are expected to be returned," said Thakorn. G. Khemadhat Pholdej, president of MCOT Compani Limited (MCOT), said that a meeting of the Board of Directors and the Annual Shareholders Assembly will be held during that time. Take care of the time. 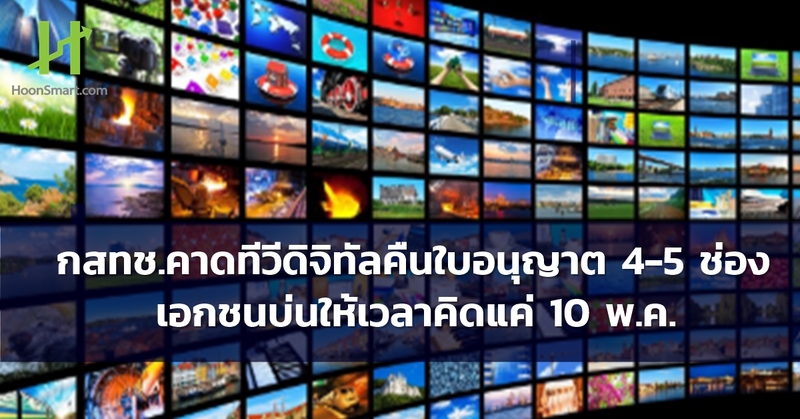 Must decide to submit a 30-day exercise, including the return of the license for digital television to affect the network operator (MUKS), and MCOT is both a digital television operator and a network service provider. Which will be presented at a meeting of the Governing Board on April 23 and will be held on April 26th. Earlier sources from BEC Vorld (BEC) found that the company is currently not yet decided whether to return the license for digital television. Firstly, detailed information from the NBTC explanation will be provided. The Steering Committee The meeting will be held on April 19th. Currently, the digital TV has 22 channels, 7 HD channels, 6 SD channels, 7 channels and 2 channels for children.